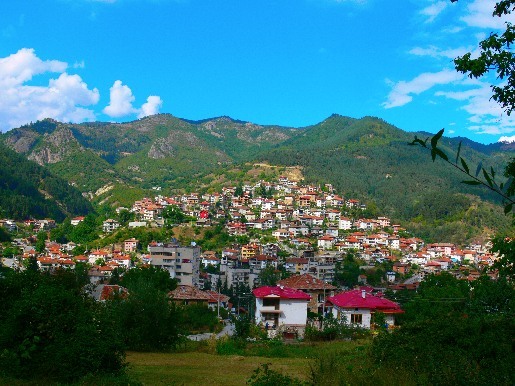 Location The town of Devin is located in the heart of the Central Rhodope Mountain range, in the valley of Vacha, at a height of 684 m above sea level. 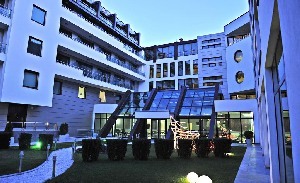 Devin is 220 km away from Sofia, 100 km from Plovdiv and 35 km from the Pamporovo resort complex. Climate It’s climate is temperate continental, influenced by southern air masses: the winter here is mild and the summer is fresh. There are 285 sunny days a year. The average temperature in January is -1,5? С and the annual average temperature is in the region is +11? С. About the Devin mineral water Devin is famous with the wonder-working properties of its mineral water. The water temperature in different springs varies from 37 to 42° С. The mineral water is reached here by deep-hole drilling. Due to its properties the local water is eminently suitable for drinking balneotherapy for renal, urologic and gastro-intestinal diseases. The external use of the Devin water lowers the blood pressure, soothes the joint pain and improves the functional status. By its properties the Devin water is hyperthermal, with no colour or smell, with light mineralization and acidity; it contains sodium hydrocarbonate and fluorine. The mineral water from the Beden spring is suitable for curing various musculoskeletal and cardiovascular disorders as well as for treatment of neuropathies. Around Devin There are unique natural phenomena in the surroundings like “Struilski dol” waterfall, Trigrad canyon and a lot of caves. You can visit the architectural reserve and ethnographic museum in the small town of Shiroka Laka. Treatment modes: water therapy, mud therapy, physical therapy, kinesitherapy, drinking balneotherapy. Contraindications: open tuberculosis, malignant diseases, mental illnesses, infectious diseases, pregnancy.